Just back from London, mates! Did you miss me? Here’s some healthy comfort food to make it up to you! 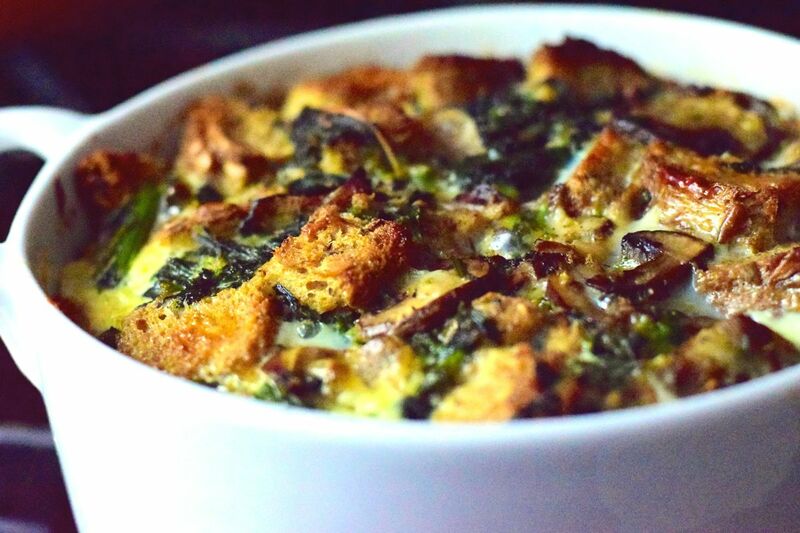 Savory bread pudding features cubes of hearty whole-grain bread, broccoli rabe, mushrooms, and Gruyére cheese, bound with eggs & low-fat milk, then baked until puffed and golden. Having just been in London, I’m reminded that the Brits call dessert “pudding”. But this is not that kind of pudding. This is a main dish if you’re vegetarian, or a hearty savory side if not. It would also be a most excellent brunch dish! Or should I say egg-cellent? Teehee. This recipe is adapted from a New York Times recipe by my hero, Martha Rose Shulman. See, I had to adapt it because I actually found myself saying upon getting home from work and opening the fridge, “Oh no, I’m out of kale”. I probably never would have said that sentence about 3 years ago. Luckily, I had a bunch of broccoli rabe just waiting for a destiny. Voilá! I sautéd the broccoli rabe instead of blanching it as the recipe directs, figuring I could reuse the skillet for the mushrooms and save a pan. Yay for fewer dishes to wash! My mother should be proud. Although I also think my mother would add some cubes of ham to this, so feel free to do that if you’re not vegetarian! Equipment: Large skillet with cover, large mixing bowl, 2 quart casserole dish. Prepare the broccoli rabe: In large skillet, heat 1 T. olive oil over medium heat. Add the broccoli rabe (it's OK if water is still clinging to it, but be careful because it might sizzle), salt & pepper, and garlic. Stir well, lower the heat, and cover to steam for about 5 minutes, or until broccoli rabe is wilted. Remove broccoli rabe onto a plate and wipe the skillet clean. Prepare the mushrooms: In same large skillet, heat 1 T. olive oil over medium heat. Add the mushrooms, lightly salt & pepper, and cook, stirring often until they start to soften. Add the dried thyme and continue cooking & stirring until they release their liquid. Stir in the broccoli rabe, and remove from the heat. Assemble the bread pudding: Preheat oven to 350 degrees F. Butter a 2-quart casserole dish. In a large mixing bowl, combine the bread cubes, mushrooms & broccoli rabe, and the two cheeses, and toss together. Transfer to the prepared baking dish. Beat together the eggs, milk, and a bit of salt & pepper, Pour over the bread mixture. Let sit for 5-10 minutes so the bread can absorb the eggy goodness. Bake the bread pudding: Place in the oven and bake 45-55 minutes or until puffed and golden, and the eggs are cooked through. Remove from the oven and serve hot or warm. Enjoy! Liked this post? Subscribe by email (up top) for more fun, fresh vegetarian and seafood recipes!